Aid organisations have to react rapidly and effectively in crisis situations. Logistics is a crucial aspect of such action. A research project of the FWF is focused on how private logistics companies and humanitarian organisations can intensify their cooperation and work more effectively. Economists develop optimal pricing and contractual forms for this purpose. Catastrophes and emergency situations are becoming more frequent throughout the world, and tend to have dramatic effects over a long period of time. Humanitarian organisations are confronted more than ever before with the difficult task of providing efficient and effective aid to those affected by these situations. Simultaneously, they have to take aspects of sustainability into account. The logistic challenges are formidable, including the pressure of time, a demolished infrastructure, and bureaucracy. Given their know-how and international networks, private logistics companies can serve as crucial partners in crisis situations. Scientists at the Vienna University of Economics are currently working on a project of the Austrian Science Fund FWF, whose purpose is to determine how the expertise of private service providers can be carried over to the humanitarian sector. With the aid of game theory models, Tina Wakolbinger’s team at the Institute of Transport and Logistics is analysing those logistics activities of aid organisations that can be outsourced to commercial organisations, and what contractual forms and prices will ensure that the results of this approach are beneficial to all concerned parties. The type of catastrophe, the characteristics of the aid organisations, and the respective phases of crisis situations will be taken into account: “Logistics has traditionally been of secondary importance in many non-profit organisations, although this sector has been responsible for a large part of the costs,” explains Tina Wakolbinger, whose field of specialisation is the strongly growing research sector of humanitarian logistics. Humanitarian aid is an enormously large market for the private sector. However, according to Tina Wakolbinger, collaboration with international disaster assistance organisations is currently associated with a lot of difficulties. The surveys conducted during the ongoing project mentioned above show that scepticism prevails on both sides. The difficulties include lack of confidence, the measurement of performance, and the exchange of information. Especially smaller non-profit organisations are afraid of becoming dependent on a corporate partner. Ensuring the safety of staff members is an important concern for private enterprises. It takes time and resources to establish successful cooperation. A successful example of companies participating in disaster assistance is the Disaster Response Team of DHL, which assists in handling the flow of relief supplies at airports. “A great deal has occurred spontaneously and without evaluation so far,” explains the scientist. “Now corporate enterprises are starting to think more specifically as to what would be meaningful and how cooperation could be useful in the long term. “ In addition to economic considerations and entering new markets, it includes gaining a good reputation and motivating one’s staff members. Companies send their staff to crisis regions; aid organisations benefit greatly from this measure. It can be a motivating and instructive experience for logistics professionals as well, because they learn a great deal from NGOs about working with limited resources under the pressure of time and about local markets. “Such cooperation must be profitable for all partners in the long term,” says Wakolbinger. Therefore, it is important to formulate the terms of a contract specifically, and clarify crucial questions like the scope, deadlines, and regional demarcations of charitable services. Even universities – including Vienna University of Economics – are now reacting to the growing market of humanitarian logistics, and offer teaching programs for disaster management. Given the growing demand for humanitarian operations, aid organisations also need to address the sustainability of their activities. 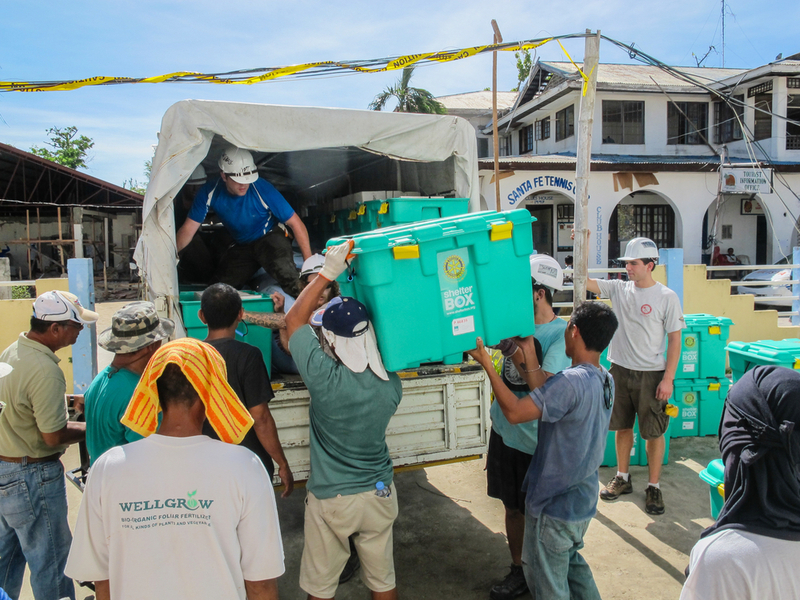 So-called return logistics in disaster situations has received too little attention from the scientific point of view, says Wakolbinger, who is also investigating this sector in her research project. The question is, what happens to medical waste, chemicals, packaging, or articles of daily use once the humanitarian intervention has been completed? The sustainability of product designs, such as tents, is very important. Companies and NGOs like “Disaster Waste Recovery” (www.disasterwaste.org) have specialised in the sector of waste management in disaster situations and organisations are committing themselves to rapid as well as sustainable aid. Tina Wakolbinger is a Professor of Supply Chain Services and Networks, and head of the Research Institute for Supply Chain Management at the Vienna University of Economics. She studied international economics at the University of Innsbruck and management science in the USA. Wakolbinger’s research work is specifically focused on humanitarian logistics and sustained supply chain management. The FWF research project Optimal Pricing and Contract Design in Humanitarian Logistics will continue until 2016.